St Pancras Old Church is of the oldest established in London. The altar houses a 7th century altar stone, and medieval fabric survives, although much of the visible church dates from 1848. It retains its rural character, where the River Fleet once flowed, surrounded by a Victorian park and historic burial grounds, including the tombs of John Soane, Mary Wollstonecraft and many others of note. These monuments, and the church itself, have survived the dramatic impact of the railway lines running through the churchyard, into and out of the train station that takes its name. Ancient drains, however, threaten the longevity of this picturesque Grade II* listed building and the St Pancras Old Church appeal is being launched on St Pancras Day, May 12, 2013 to help raise funds. All money raised will go towards building new drains and securing the cracks in the stone walls. 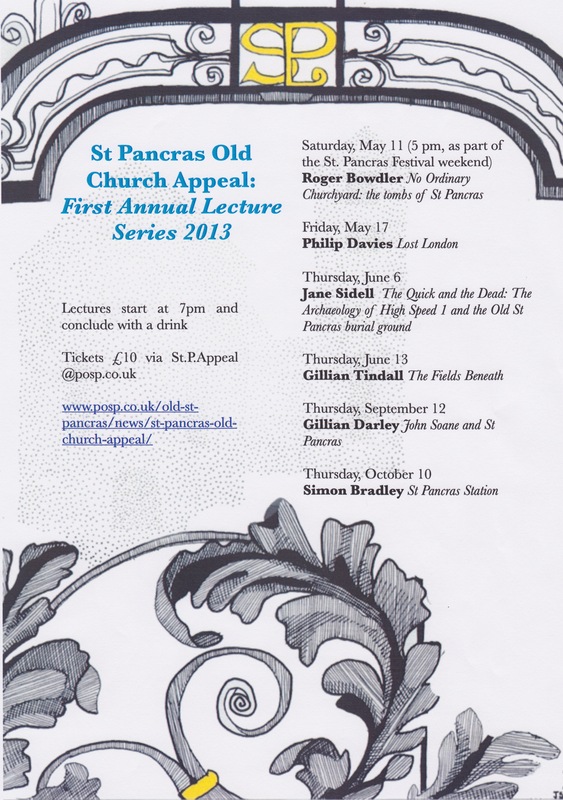 To support the Appeal, please join us at our series of talks on the history of this fascinating part of London given by leading historians and authors. Friday, 17 May, 7 p.m.
Thursday, 6 June, 7 p.m.
Thursday, 13 June, 7 p.m.
Thursday, 12 September, 7 p.m.
Thursday, 10 October, 7 p.m.